Bogged down in the administrative minutia of running an irrigation company? If you’re currently searching for a more efficient way to run the show, consider Smart Service, the irrigation software developed to make running your business easier. Our irrigation software is the perfect solution for irrigation service companies of every shape and size. Smart Service saves massive amounts of time and money by automating your everyday job processes. What’s the secret to Smart Service’s unprecedented time savings? A seamless QuickBooks connection! 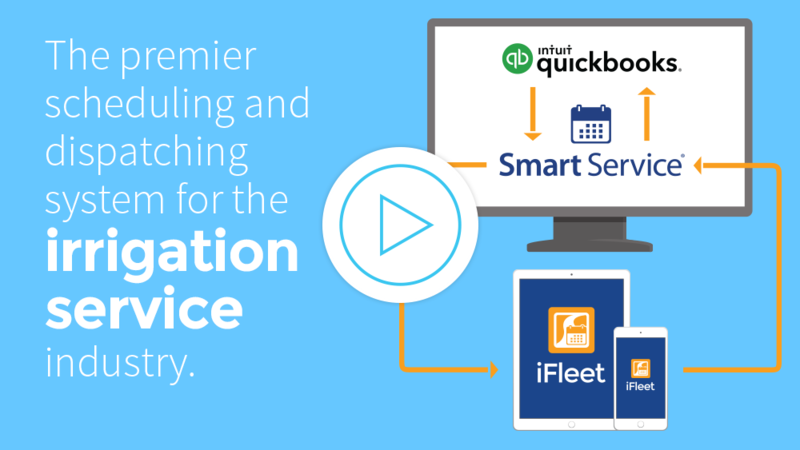 Smart Service adds several points of functionality to QuickBooks, each specifically geared toward helping your irrigation service company excel. Schedule jobs for your current customers and marvel as the work of your irrigation company is mirrored inside QuickBooks. Learn more. The irrigation business is all about regular customers and recurring service routes. Smart Service was designed to accommodate these arrangements in one irrigation software solution. Setting up a job to repeat on a regular basis has never been easier, now that our irrigation scheduling software has stepped onto the scene. When digital paperwork comes back from these repeat appointments, much of the backend administration is already finished! Learn more. Want to truly revolutionize your job process? Get your hands on the mobile app iFleet and your field employees will economize time and effort in every aspect of their work for your irrigation company. iFleet puts schedules in the palm of your workers’ hands, as well as irrigation service histories, equipment information, and comprehensive customer contact data. Better still, field workers can complete paperwork on location, greatly reducing their administrative obligations. Learn more. We chose Smart Service because of the full integration with QuickBooks. Master the irrigation business in a few short articles!